Founded in 1961, Cline Doors has been providing high quality commercial doors for over 50 years. As the oldest manufacturer of flush aluminum doors in the country, Cline prides itself on manufacturing quality doors and frames that withstand the harshest environments. The Series 100BE Aluminum Flush Door sets the industry standard with our experience in the commercial arena. Cline, expanding on this success, introduced the Series 200BE FRP Flush Door, the Series 400SE Heavy-Duty Screen Door, and the Series 500SE Stile and Rail Door. These different door series all facilitate in meeting or exceeding the demands from architects, owners, and contractors. Cline Doors is the perfect fit for your commercial, governmental, educational, industrial, recreational, or transportation applications. Founded in 1956, West Bradenton Baptist Church is one of the oldest churches in Manatee County, Florida. When it came to replacing the exterior doors, a delicate balance had to be made to preserve the rich history of the building while also adhering to tough hurricane requirements of a coastal setting. Fortunately Cline's Series 100BE doors fit the bill! It offered the church an ascetically pleasing door while also exceeding the hurricane and structural design load requirements. The historic building now has the exterior doors build to last that can take on the toughest environments. 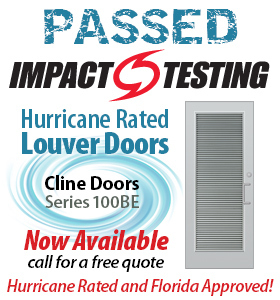 Cline Doors is excited to announce the expansion of our hurricane rated door line. The flush door market has long needed an impact rated louver door and we have developed a fixed louver door system to answer the challenge.